Price Chopper’s senior corporate dietician, Ellie Wilson, talks to a group of CDPHP members about buying healthy foods on a budget. “I think this is great for kids!” said Tina Whelan, a CPDHP member who took part in the shopping class. “I’ll bring my kids here. They’ll think it’s a game!” added Whelan. Buying healthy food on a budget isn’t always easy. That’s why CDPHP® has teamed-up with Price Chopper Supermarkets to provide its members with a wellness class that helps them make smarter and more nutritious food choices. 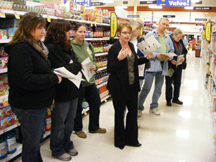 A group of fourteen CDPHP members joined Price Chopper’s senior corporate dietitian, Ellie Wilson, and staff dietitian Dianne Fagan for a tour of the Price Chopper on Balltown Road in Niskayuna. Members learned about the supermarkets NuValTM Nutritional Scoring System, a unique, consumer-friendly scoring system that rates the nutritional content of food on a scale of 1-to-100. Currently, over 18,000 food items have NuVal Scores at Price Chopper. Members also had the opportunity to ask questions about their own shopping needs, and how they can get the best nutrition value on a budget. “I thought it was a fantastic class,” said Holly Contompasis, a CDPHP member who participated in the program. “Previously, when I saw the NuVal numbers, I never gave them a second thought. Now, I’ll pay attention to the scores and select foods with better nutritional value,” added Contompasis. “I think this is great for kids!” said Tina Whelan, another CPDHP member who took part in the shopping class. “I’ll bring my kids here. They’ll think it’s a game!” added Whelan. March is National Nutrition Month, a campaign focused on the importance of making informed food choices and developing sound eating and physical activity habits. In the United States, one-third of all adults are obese, a medical condition that leads to heart disease, stroke, type 2 diabetes, and certain types of cancer. “Obesity is a costly medical condition with an estimated $150 billion price tag on our nation’s health care system,” said Dr. John Bennett, president and CEO, CDPHP. “As a physician-founded, member-focused, community-based health plan, we believe it is our responsibility to be part of the solution,” added Bennett. “As a business dedicated to providing many of the vital foods and supplements that help people feed and care for their families, Price Chopper recognizes the importance of the role that we play in the lives of our customers. Hence the impetus behind our investment in a comprehensive Rx, health and wellness platform that includes a team of professional nutritionists with diverse specialties and reliable tools like the NuVal nutritional scoring system,” said Mona Golub, vice president of public relations, Price Chopper. In addition to the Price Chopper store tour, CDPHP also offers members a variety of nutrition-based wellness classes, including Dash to Your Garden, Fishing for Health, and a vegetarian cooking class. For more information on these classes, click here. Established in 1984 as a physician-founded, member-focused, and community-based not-for-profit health plan, CDPHP and its affiliates are uniquely positioned to serve as a model of quality and health value, offering members in 24 counties throughout New York a full array of innovative products. Visit CDPHP at http://www.cdphp.com or on Facebook, Twitter, or LinkedIn. Based in Schenectady, New York, the Golub Corporation owns and operates 128 Price Chopper supermarkets in New York, Connecticut, Massachusetts, New Hampshire, Pennsylvania and Vermont. The American owned, family-managed company prides itself on longstanding traditions of innovative food merchandising, leadership in community service and cooperative employee relations. Golub’s more than 23,000 teammates collectively own more than 50% of the company’s privately held stock, making it one of the nation’s largest privately held corporations that is predominantly employee-owned. For additional information, visit http://www.pricechopper.com.